This plant is native to the region extending from the eastern Mediterranean to India and was extensively cultivated in ancient Egypt. It is an annual plant, that can grow up to 4 feet and is grown for it's fibers and seeds. Besides that, it is a very beautiful plant that can lighten up your garden. Various parts of the plant have been used to make fabric, dye, paper, medicines, fishing nets and soap. Seed of the flax plant, containing omega-3 and omega-6 fatty acids and lignans (beneficial plant compounds, similar to fiber). Whole seeds, ground meal or flour, capsules or oil. Whole seeds must be ground into meal or flour; 30 g (1 ounce) daily. Capsules, available in 1,000 mg to 1,300 mg, no typical dosage. Oil, 1 to 3 tablespoons daily. Eases symptoms of RA, lupus and Raynaud's phenomenon. Lubricates joints and lessens stiffness and joint pain. Lowers total cholesterol and reduces risk of heart disease and some types of cancer. Improves hot flashes and dry skin. Flax seed is high in alpha-linolenic acid (ALA), a type of omega-3 fatty acid that can be converted to EPA and DHA (the active ingredients in fish oil). Flax seed is a good source of fiber. Lack of studies on whether flax­seed improves symptoms of RA, but omega-3 fatty acids are known anti-inflammatories. 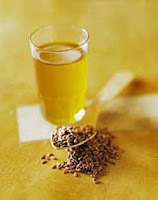 Mixed results about whether flax seed, or flax seed oil, can accelerate or slow progression of prostate cancer. Fiber in flax seed can impair absorption of some medications, and as flax seed acts as a blood thinner, beware when taking blood thinners, asp­irin or other NSAIDs. Flax seed should be avoided if you have hormone-sensitive breast or uterine cancer, and used with caution if you have high cholesterol and are taking cholesterol-lowering drugs. The bast of the stem of the flax plant is used for linen fabrics like damasks, lace and sheeting. Coarser grades are used for the manufacturing of twine and rope. Did you know Flax fiber is also a raw material for the high-quality paper industry, for the use of printed banknotes and rolling paper for cigarettes? Never too old to learn, huh. For the weight-watchers amongst us, 100 grams of ground flax seed supplies about 450 kilo-calories, 41 grams of fat, 28 grams of fiber, and 20 grams of protein. The sprouts are edible and have a light spicy flavor. Ground flax seed has a nutty flavor to it. One tablespoon of ground flax seeds and three tablespoons of water may serve as a replacement for one egg in baking by binding the other ingredients together. Substitute flax for fat in your recipes, using 3 tbsp ground flax seed for 1 tbsp of margarine, butter or cooking oil. Keep in mind, whatever you bake with it, it will brown quicker! Flax seed is used in many recipes, I am sure you can find lots online, if you are interested. There are also grounding kits for flax seed available. Be careful though, consuming too much flax seeds can cause diarrhea, so know your limit. This plant has been domesticated and grown, because of it's benefits and many usages, for ages. People go through great lengths to grow, harvest and mold it into the end-product, they know it can be. Maybe we could and should be more like Flax in God's hands. I hope y'all are doing well. How is your mom? We remember her in our prayers. Corry, I have wondered about flax seeds and had not had much time to research it. Thanks for the great info. You and your family are in our thoughts and prayers. I was thinking and praying for you today. Blessings. I am so sorry to hear that. We will keep remembering her in our prayers and you as well. Thank you so much for the prayers, we appreciate it very much. Many blessings to y'all and may God grant you a very blessed weekend.